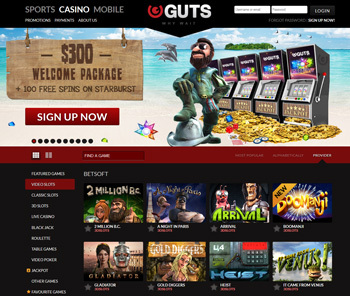 Guts Casino was established in May of 2013 with the goal of becoming the best online casino available. They realized that even the best online casinos just weren’t good enough, and decided to rise above the standards to give us players a better online gambling experience than we are used to. What makes Guts Casino so great? The main thing is their withdrawal time. We are all used to withdrawals taking a day or two at the least, but Guts aims to process withdrawals within 2 hours! That is of course once your account details and identity are verified, which is done faster than most casinos as well. They don’t put a guarantee on that 2 hours, but based on feedback from many players, they make good on that promise. Also, free gifts are exactly that, free – with no strings attached – which is something you never see anymore. That doesn’t include deposit bonuses of course, but what they call “Guts Gifts” (I assume that means free chips and other gifts they give to loyal customers) and all winnings from free spins go straight to your cash balance, with absolutely no wagering requirements. Since so many online casinos come and go, and so many fail, I will normally wait for at least a couple years before I consider listing a casino on this website, but Guts has really impressed me since they opened last year. They have gotten a ton of praise on various gambling forums from players all over the world since the casino opened. Guts Casino has over 700 games from 11 different software providers. Some of these games are not available to Canadians due to licensing restrictions – for example we can’t play IGT or WMS slots because those companies make the slots that are in our land based casinos. They have games from Betsoft, Evolution Gaming, IGT, Leander, Microgaming, Net Entertainment, NextGen, NYX, OMI, Rabcat, Quick Spin, and will be adding WMS soon. They also have a sports betting section where you can bet on sports events including football, hockey, horse racing, motor racing and more. The Welcome Bonus is a 4 part bonus worth up to $300 along with 100 free spins on Starburst, a Net Entertainment slot. You can get a 100% bonus on your first deposit, worth up to $100, and 25 free spins on Starburst. Then 50% and 25% bonuses on your second and third deposits, both worth up to $50, with 25 free spins added on each deposit, and finally a 200% bonus worth up to $100 with another 25 free spins. Before all that, just for signing up you’ll get 10 free spins on the popular Piggy Riches slot, simply load the game after you sign up and start playing your free spins. There are many banking options and currencies available to people all over the world, with CAD being available along with many popular Canadian banking options. The options for everyone include VISA, MasterCard, Skrill, Neteller, Ukash, Paysafecard, Ecocard, Sofortüberweisung, Ideal, InstaDebit, Euteller, Gluepay, WebMoney and Wire Transfer, and you will get a list of only the options available to your country when you go to make a deposit or withdrawal. The supported languages include English, Swedish, Finnish, Norwegian and German. There is absolutely no reason not to sign up at Guts.com and give them a shot. They have a ton of games, great customer service with 24/7 live chat for help, and the fastest withdrawals I have ever seen.